14k white gold 1.25 ct diamond circle pendant dangles from a matching 18-inch rope chain with spring ring clasp. 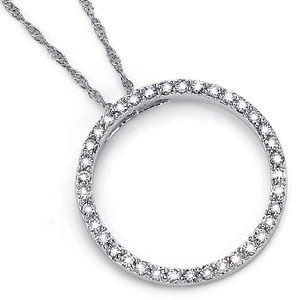 Circle pendant is 25.0mm in diameter. Diamond details: 46 round facted full cut diamonds; each diamond 1.85mm diameter. Diamond color I-J, clarity I1.